There has been a moving ceremony in Oslo for the handing over of this year's Nobel Peace Prize. The International Campaign to Abolish Nuclear Weapons (ICAN) was honoured for its collective work with dozens of NGOs. Beatrice Fihn, the group's executive director, said in a speech: "The story of nuclear weapons will have an ending and it is up to us to decide what that will be. "Will it be the end of nuclear weapons? Or will it be the end of us? One of these things will happen. "The only rational course of action is to cease living under the conditions where mutual destruction is only one impulsive tantrum away." Another ICAN campaigner says she survived in the rubble of Hiroshima when she was aged 13 by pushing towards the light - and a nuclear ban is the new light to strive towards. Setsuko Thurlow told the audience gathered in Oslo City Hall: "To all in this hall and all listening around the world, I repeat those words that I heard in the ruins of Hiroshima: don't give up, keep pushing, keep moving. See the light." Another moving moment in Sunday's award ceremony was a performance by the singer John legend, singing Redemption Song by Bob Marley. Earlier, in a joint appeal to a media briefing, Fihn and Thurlow urged the United States and North Korea to "back down from dangerous rhetoric" and threats to use weapons of mass destruction. "Engage in a diplomatic solution," said Fihn. "A diplomatic solution is the only solution," said Thurlow. ICAN is a coaliton of NGOs pushing for a UN prohibition treaty. An agreement was adopted by 122 countries in July but so far only three have ratified it. To come into force the treaty needs to be ratified by 50 nations. But the treaty is not signed by any of the countries that already possess nuclear weapons: the U.S., Russia, China, Britain, France, India, Pakistan and North Korea. Israel is also widely assumed to have nuclear arms. 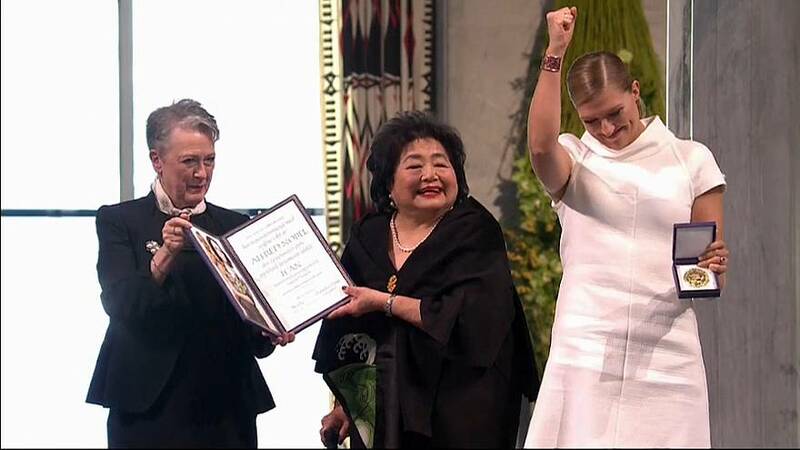 Fihn made it clear that she was accepting the prize on behalf of "thousands of inspirational people who make up the international campaign to abolish nuclear weapons". "I am just one member of this huge grassroots movement, who together have brought democracy to disarmament and are reshaping international law. She added: "At dozens of locations around the world, in missile silos buried in our ground, on submarines navigating through our oceans and aboard planes flying high in our sky like 15,000 objects of humankind's destruction. "And perhaps it is the enormity of this fact. Perhaps it is the unimaginable scale of the consequences that leads many to simply accept this grim reality, to go about our daily lives with no thought about the instruments of insanity all around us. "For it is insanity to allow ourselves to be ruled by these weapons. Many critics of this movement suggest that we are the irrational ones, that we are idealists with no grounding in reality, that nuclear armed states will never give up their weapons. "But we represent the only rational choice. We represent those who refuse to accept nuclear weapons as a fixture in our world. "Those who refuse to have their fates bound up in a few lines of launch code. Ours is the only reality that is possible. The alternative is unthinkable."